Now that the kids are back in school, lunch packing at my house is in full swing. I must admit that it can get overwhelming to try to plan healthy lunches with a good variety of foods - especially when your kids are picky - or decide from one day to the other that sandwiches are not on the menu anymore. Let me introduce you to MOMables! A school lunch meal planning service that helps parents feed their kids a variety of lunches they will love. Their one simple plan approach has built in substitutions for vegetarian, gluten free and nut free options when needed (it is not a dairy free or vegan plan). MOMables was started by Laura Fuentes, a mom of 3 kids under seven years old, to help other parents get out of the lunch packing rut. 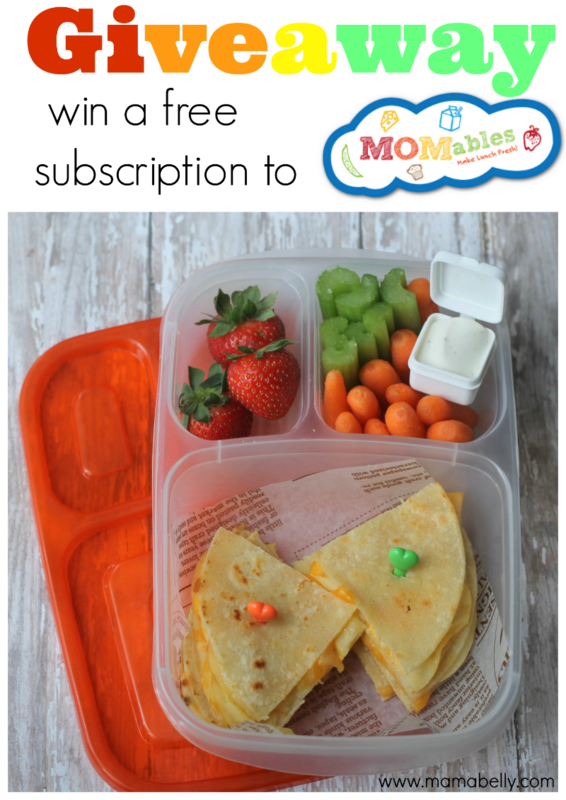 MOMables offers a weekly school lunch meal plan with 5 lunch ideas, a prep-ahead sheet and a shopping list to help us busy parents feed our kids good food they will actually eat for only $6 per month! Laura has been kind enough to offer my readers a sample week of MOMables for FREE, when you sign up for their weekly newsletter. It’s also loaded with free recipes, tips and so much more. gluten free Apple & Cheese Quesadillas (I substituted corn tortillas to make the lunch gluten free) - recipe is in the sample week of MOMables! The winner will be notified via email. Please respond within 48 hours or a new winner is drawn. Do not enter this giveaway if you have won a MOMables subscription in the last 3 month. Disclaimer: I received a free 3 month subscription from MOMables. However, all opinions are my own and I frequently purchase the subscription myself. I would love to win because I have twin daughters and need new lunch ideas!!! My son just started kindergarten and I have loved packing his bento style lunch/snack- it's been making my picky eater more open to different foods including veggies. But, I am only one week in and am realizing that I could easily get stuck in a rut. This would be great to help me keep a fresh take on his bento. Thanks for the giveaway!! I would love to win to keep giving my daughter variety in her lunch bag. I would love to win me and my 4kids follow you together its something they look forward to seeing and doing with me everyday thank you! This would be a great way to incorporate new ideas & healthy foods into my LOs lunchbox! Wishing myself luck! Lots of lunch ideas for the picky eaters! We are only a month into school, and I'm kinda already over the lunches I've been making. I need INSPIRATION! I am SO stuck in a rut and never know what to pack. So, I am always stuck with peanut butter and jelly or turkey sandwich. This sounds like the perfect testing ground. I love packing lunch for my boys and it would be awesome to have some new ideas. I love packing lunch for my sons and it would be awesome to get some new ideas. It would be great to have more ideas for healthy lunches to send to school with my younger son, and myself. Would also be amazing to have easy to assemble ideas for my HS son who comes home for lunch. 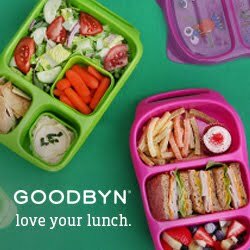 It would be amazing to have healthy ideas for packing lunches for my younger son, and myself, as well as easy to assemble lunches for my HS son who comes home for lunch. I know I am tired of the same ol sandwich lunch packing. I know my son(he's 5) has to be tired of it as well. I try to spice it up with different things, but I would love to have more ideas. It would be so awesome to have the details taken care of for me! I would love to win to see if I want to pay for the subscription! I would love to win this for some great new ideas! I would love to win for the great meal ideas. I'm always looking for healthy alternatives for my kids. I would love to win!! I struggle to find lunches that the kids won't get bored with and your lunches always seem so fun! !